We remodeled our first kitchen on Moreland Avenue in Chestnut Hill back in 2009. In 2011 we were lucky to have a chance to remodel the next door neighbor's house. The kitchens were almost identical to begin with, the mirror image of each other. The end results, as you can see from the pictures, are quite different in style, though the guiding principles in both renovations were similar. The layout of the original kitchens was awkward, removed from the rest of the house, with no connection to the homes; beautiful backyards. The goal in each case was to open up the kitchen to the dining room, as well as relocate the basement stairs and the exit to the back yard. 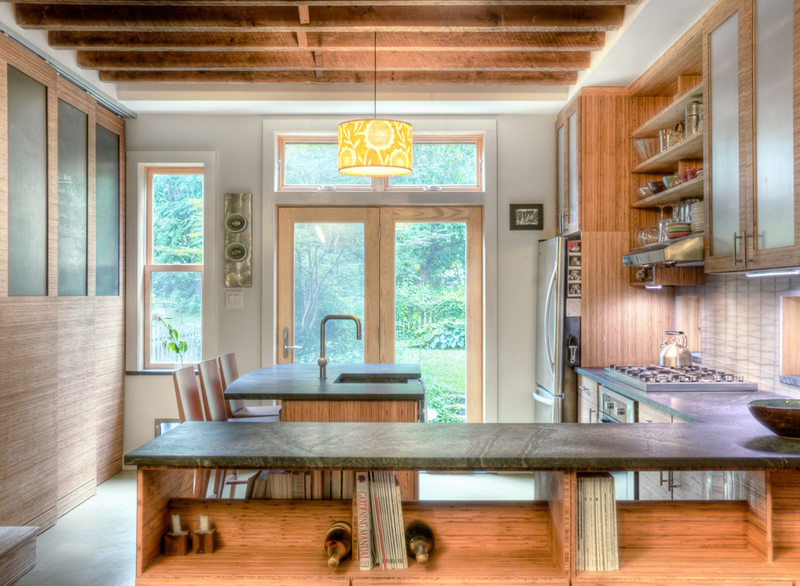 The first kitchen we remodeled was the home of the principals of a world renowned green architecture firm, so we were blessed with a great team to help us through what were some tricky maneuvers. They spent a long time ironing out the design before we even showed up. The second time around, we were experts and the job went as smoothly as construction projects can. On the second kitchen we took on an additional challenge; salvaging the original Heart Pine floors. Normally, if a wood floor has had vinyl floors and subfloors nailed and glued to it we recommend against trying to restore them. In this case though, patching in local salvaged wood floors where the old stairs were left us with one continuous floor; from the front of the house to the back. We hired Buckminster Green for a significant renovation project at our house and have since recommended them to a number of our architecture firm’s clients who are interested in a builder who will actively support their green goals. Having worked with many local builders over the years, we find BG to be particularly collaborative, responsive, honest, and thoughtful about quality. “Kenny completed our kitchen renovation during the end of 2011 and the beginning of 2012. From our first meeting, Kenny was able to help us with ideas to construct the kitchen that we wanted, led us to the right places to look for counters, cabinets, etc, and always answered all of our questions in a timely fashion. We had quite a large renovation that included taking down walls (both interior and some exterior), we had a deck added to our backyard, French doors that open to our deck, all new cabinets, appliances, lights, countertops, and pulls. Kenny and his team at Buckminster Green always cleaned up after themselves, let us know exactly what was going to be accomplished each day/week during the actual renovation, and every person that was in our house was respectful (we live in a twin and our neighbors even complimented them on how wonderful they were).